If you are hunting for a new home, we can help! Join us for coffee and talk to our knowledgable team about our real estate services. We have been working in Indian Land for over 11 years and can answer any questions you have about the local market. Join Laura and Andrea the second Wed of each month for delicious treats and conversation. Learn about what is happening in our community, real estate trends, and active adult communities nearby. We are here to answer your questions. As members of the community, we share your questions and concerns! Laura Pogue understands that everyone has a story to tell that is as unique as their own fingerprint. In fact, it’s this emphasis on the personal aspects of a move that has made her a leading real estate professional for many years. With Team Pogue on your side during the sale or purchase of a home, you can count on them to listen carefully to your goals and tailor their service to your personal objectives. When it comes to 55 plus active adult, Sun City Carolina Lakes and Indian Land real estate, don’t make a move without the right information and the right professional by your side. More and more Sun City Carolina Lakes and Indian Land area residents are turning to Team Pogue for their real estate needs. All of our agents live, work and play in the Indian Land area. We know the community and can help you find the right neighborhood and home for you! Contact Team Pogue today to experience the thorough professionalism of a team approach and the personalized and caring service of a dedicated professional. It’s Real Estate with a Personal Touch. Call Team Pogue today at 803-504-1111. Stunning all-brick, 4BR + Bonus/3.5BA, 1.5 story sits on an acre lot on a quiet street without an HOA. Fenced area includes an inground-pool and pergola, outside the fence is a screened pavilion w/lights, swing w/pergola, lush landscaping, brick walkway and irrigation. The interior has hardwoods thru-out the first floor, ceiling fans, newer stainless appliances, white cabinets, granite counters, tile backsplash and recessed lighting. The home features gas fireplace, water softener, newer roof and tankless water heater. Master bath has cream cabinets, quartz counter, bronze fixtures, large shower & dual vanities. 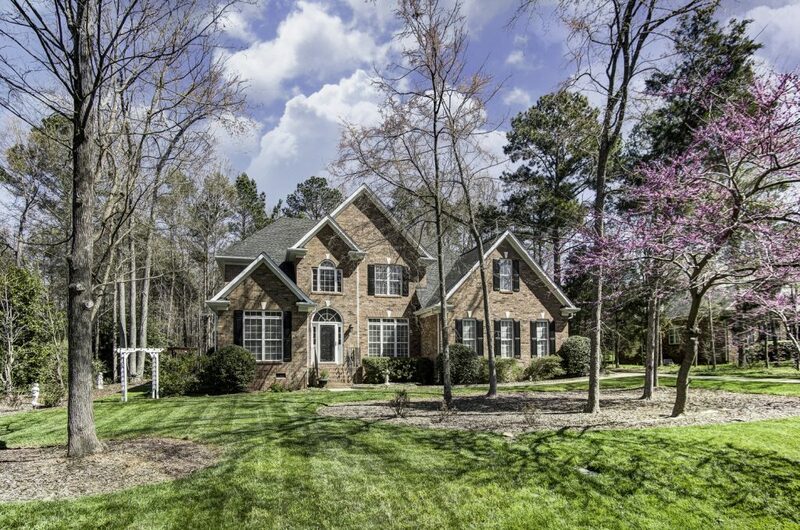 Fantastic location – EZ access to 485, minutes to Waverly, Blakeney shopping, Weddington schools and Union County taxes. This home has been meticulously maintained. Click here to view the tour. Summit Collection home with golf course views! Beautiful Willow Bend model located near the front of the community with an easy commute to amenities. Fantastic cooks’ kitchen with SS appliances, granite counters, cabinet pull outs, large island for that extra work space, under cabinet lighting and many more upgrades! Enjoy the natural light and ease of entertaining in the open concept. Great room features ceiling fans, built ins, & a gas log fireplace with granite surround to warm up on those cooler nights. Master suite offers a tray ceiling, walk in shower, garden tub, dual vanity, and a large walk-in closet. Relax in the sunroom, or on the extended paver patio overlooking the golf course and enjoy the views! Garage with epoxy flooring and keypad access are a bonus touch. Beautiful home on a cul de sac lot overlooking a large, level, tree lined, private back yard! Great curb appeal with the established landscaping and stacked stone flower bed border welcomes you home. Many features including crown molding, wainscoting, hardwood & tile flooring and upgraded light fixtures. Kitchen offers ss appliances, granite counters, eat in nook, tile backsplash, under cabinet lighting and an island for that extra storage and work space. Gather in the great room with the marble surround fireplace or relax and entertain in the sunroom. Owners suite with plantation shutters and large walk in closet with an owner’s bath, featuring dual vanity, garden tub and a separate glass enclosed shower. Garage offers plenty of storage with floored attic space above, & cabinets. Enjoy the extended patio, complete with an electric awning for those hotter days. Charming Gray Myst model with a sunroom is ready to welcome you home. Featuring hardwoods & crown molding throughout the main living areas in this open concept. Kitchen offers newer stainless steel appliances, Corian counters, tile backsplash, and a home manager desk. Built in’s in the great room for easier organization. Master suite overlooks the back wooded view and bath offers a dual vanity and a walk-in shower. Bright and airy sunroom leads to the back deck and fenced yard. Enjoy the forest view while relaxing or grilling. Located near the end of the street, convenient to the walking trail that leads to the river, sporting fields & community garden. Come check out the community and the active adult lifestyle of Sun City Carolina Lakes. This home offers a bit of uniqueness to the traditional Vernon Hill model! Featuring an open concept, newer carpet in the bedrooms, LVP in the main living area, & porcelain flooring in the kitchen. Kitchen offers granite counters, tile backsplash, and a home manager station. Relax in the great room in front of the gas log fireplace, or in the sunroom overlooking the extended paver patio with a waterfall & pond. Master suite features a tray ceiling, custom built closet, garden tub with tile surround, glass encased shower, and dual vanities. Step out of the kitchen onto the pergola covered patio with established landscaping and enjoy the beautiful water feature. Garage offers built in cabinets, epoxy floor finish & keypad entry. Come check out the community and the active adult lifestyle of Sun City Carolina Lakes. This 3BR/2.5BA Manor collection home with full front stone and brick veneer offers beauty inside and out! Featuring fresh neutral paint throughout, new carpeting in the secondary bedrooms, hardwoods in the master and great room, plantation shutters and so much more. Kitchen offers stainless steel appliances, granite countertops, gorgeous cabinets with an abundance of storage & a kitchen island for that extra work space. Enjoy an evening fire in the great room with the gas log fireplace and a spacious feel with the open concept. Trey ceilings in the master bedroom and breakfast room, and the master bath features a garden tub with a separate glass encased shower. Natural light abounds in the sunroom where you can relax or entertain guests in a beautiful setting. In-ground irrigation is a bonus to help keep your yard and landscaping beautiful! Location! This Muirfield villa is conveniently located on Carolina Commons, near the shopping center. It features LVP flooring & crown molding in the living areas, ceiling fans, & solar tube in bath. Kitchen has granite counters, stainless appliances, French door refrigerator, pull out shelving & snack bar. The garage even includes an epoxy floor, storage cabinets & pulley lift for attic storage! Come check out the 55+ active adult lifestyle in Sun City Carolina Lakes! Check out this gorgeous 3BR Willow Bend with a finished lower level and a cul de sac lot. It features an open concept floorplan, hardwood floors and tile, and master on main. Kitchen offers granite counters, SS appliances, and an oversized island. Great room has a gas fireplace for those cozy evenings. Master suite on main with a tray ceiling, master bath offers garden tub w/ separate glass shower and double vanities. Finished lower level with a second master, flex space and storage. Screened porch and covered patio overlook a private, wooded backyard. 4BR/3BA Fully Upgraded Vernon Hill with Finished Lower Level...Perfect for Your Very Own Man Cave! This lovely Vernon Hill sits on the end of a cul-de-sac with deck wooded views of the green space and distant baseball field. Neutral color scheme is the perfect background to a home with all the upgrades. The kitchen is a chef’s delight, boasting granite counters, subway tile backsplash, black stainless appliances, LED above/below cabinet lighting, pendant lights, Velux sun tunnel & recessed lighting. The interior features upgraded lighting fixtures, hardwood floors upstairs, ceiling fans, built-in entertainment center, gas fireplace, blinds, whole house surge protector, garage storage system & more. This home has it all! This charming River Collection home offers easy living with its bright and open feel! An abundance of natural light flows through this open concept featuring a kitchen with granite counters, stainless steel appliances, tile backsplash, built in computer niche, & a nook for easy eat-in convenience. Crown molding featured in the great room leads directly to the sunroom where you can relax or entertain in a beautiful setting. Spacious master bedroom with crown molding, walk-in closet and a master bath with dual vanity and a walk-in shower. Enjoy grilling out on the large, sealed deck overlooking a central open area. Garage features finished walls and an epoxy flooring adding a great touch to this home that is move-in ready. Upgraded 3/2.5BA with 3-Season Porch, Extended Garage & Permanent Stairs to Attic Storage! This lovely 3BR/2.5BA Cumberland Hall model has it all. The interior boasts hardwoods through-out with carpet in bedrooms & office, crown molding, ceiling fans, plantation shutters & gas fireplace. The gourmet kitchen has a gas stove, ss appliances, French door refrigerator, subway tile backsplash, granite counters, under-cabinet lighting & pull out drawers. The 3 season porch has vinyl windows, UV shades, fan and painted floor. The extended garage features permanent stairs to the attic with floored space for storage and a radiant roof barrier. This home is move-in ready! Come check out the community and the active adult lifestyle of Sun City Carolina Lakes. Welcome home to this fantastic Surrey Crest with loft! Featuring an open floor plan with a breakfast bar, gas log fireplace, master suite with trey ceiling, 3-season porch and a kitchen with a spacious feel. Kitchen offers stainless steel appliances, Corian counters, tile backsplash, an island for that extra work space and an arched transition to the great room. Separate office with lots of natural light for a comfortable atmosphere for your business needs. Master bath features double vanities, and brand new tile shower and flooring. Relax in the 3 season porch with vinyl windows that can be enjoyed most of the year. Black wrought iron fencing in the back is a bonus! This home is move-in ready! Team Pogue specializes in helping buyers and sellers with their Indian Land Real Estate and Sun City Carolina Lakes Real Estate transactions. Find current Sun City Carolina Lakes homes for sale by clicking on the SUN CITY LISTINGS tab. Learn more about Indian Land Communities and see listings for specific neighborhoods by clicking on the INDIAN LAND COMMUNITIES tab. CLICK HERE TO VIEW ALL INDIAN LAND AREA LISTINGS in the communities featured on our website. CLICK HERE TO VIEW ACTIVE ADULT AND 55+ COMMUNITIES in our area. You can view all Indian Land area homes for sale by using our Search Listings feature. You’ll find any home listed on the MLS here on this site. Check out what neighborhoods have seen the most sales activity in Indian Land year over year as of October 2015. This map will show you what’s HOT! We are seeing more and more communities geared specifically for active adults in the greater Charlotte and Fort Mill area. Since several of our agents live, work and play in active adult communities, Team Pogue is a great resource for home buyers considering the active adult lifestyle neighborhoods. Click here to learn more about the communities nearby and contact Team Pogue today for more information about homes available in these communities. We can help you find the right home in the right neighborhood! Learn more about Sun City Carolina Lakes and the active adult market by visiting the Living Magazine online!